THE SKINNY: This has got to be the strangest-shaped eyeliner I've ever tried. But the cone-shaped crayon does work and after a few weeks of use hasn't broken or needed sharpened yet. This eyeliner delivers a smooth line that smudges easily with a brush. One application lasts about eight hours and then washes away cleanly. Is a classic pencil, not a creamy formula like so many eyeliners are these days. I tried it in blue, and it's a pretty color. KEEP OR TOSS: Keep. I'm really curious to see what happens if I make it to the bottom of the crayon. 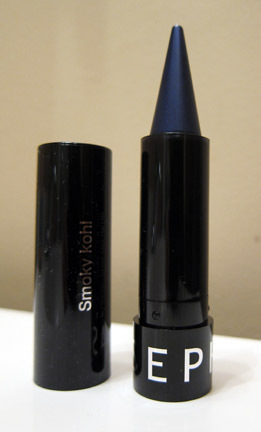 CHECK IT OUT: Of all the Sephora-brand eyeliners I've tried, the Smoky Kohl is one of my favorites.